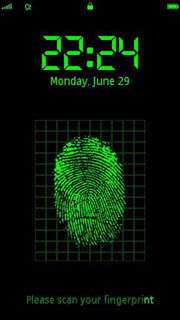 Use your fingerprint to unlock the phone, this is NOT just for fun! V2.8 enables you to block all key press when FingerPrint screen is on top! When the FingerPrint screen pops up, you need to touch your finger to the screen to be " scanned " for your identity, there will be vibration and beep sounds during the scan. Supported Phones: All s60v5 phones like 5230, 5233, 5800, 5530, 5235, N8, C7 etc. Video Preview of Finger Print Scanner.